Due to often inundated by floodwater, 100 roads in North Jakarta are now damaged. 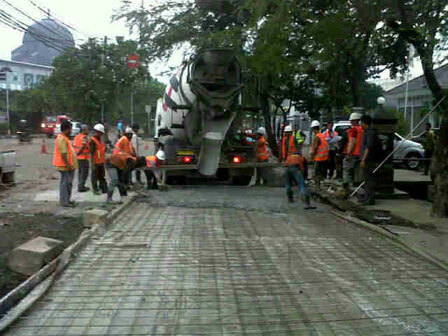 In order to repair those roads, North Jakarta Administration will concrete all of them. Among the roads to be concreted are Jalan Kamal Muara IV and Jalan Pengasinan Muara Angke in Penjaringan Sub-District, Jalan Pegangsaan Dua, Jalan Komplek Bermis, and Jalan Haji Oyar in Kelapa Gading Sub-District, Jalan TPU Budi Darma and Jalan Metros in Cilincing Sub-District, as well as Jalan Al Hidayah Komplek UKA and continuation of Jalan Kramat Jaya in Koja Sub-District. From 100 damaged roads to be concreted this year, only Jalan Kramat Jaya that has been started to be repaired since Saturday (3/22) using speed-create technology. It is estimated that the concretization of Jalan Kramat Jaya for as long as 100 meter towards Jalan Raya Jampea Raya to be completed in a week. Meanwhile, the repair of other damaged roads is still waiting for auction process. Head of North Jakarta Roads Public Works Sub-Department, Monang Ritonga, said the delay of damaged roads concretization in North Jakarta happened because his party had to wait for the auction process that takes time for about 2-3 months. “We hope the public to be patient. There are 100 damaged roads that will be repaired and concreted,” he stated, Tuesday (3/25). Ritonga also explained that the repair of Jalan Kramat Jaya had to be accelerated since its damages are severe and the road is passed by many vehicles. “Since the road is passed by many vehicles, we had to use speed-create technology which concrete’s drying process finished in 12 hours with 20-centimeter thickness,” he uttered. After Jalan Kramat Jaya repair finished, Ritonga added, the next damaged road to be concreted is Jalan Bugis in Tanjung Priok Sub-District.